JOLED showed a number of demos calling out their expertise in the OLED space. 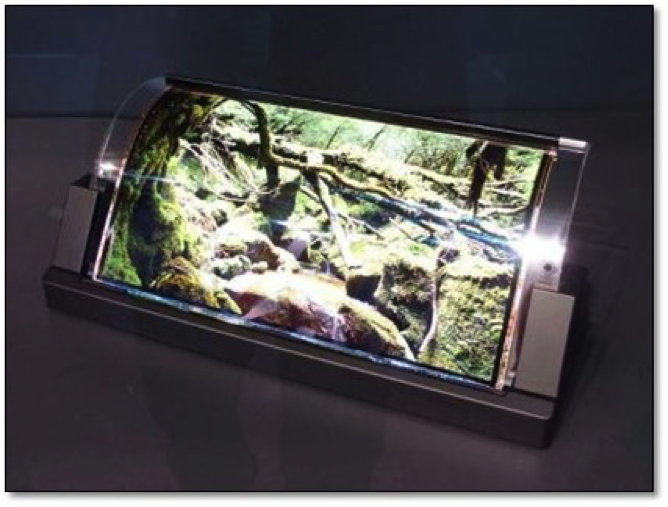 While most potential OLED producers have staked out either small panel (smartphones, smart watches, etc.) 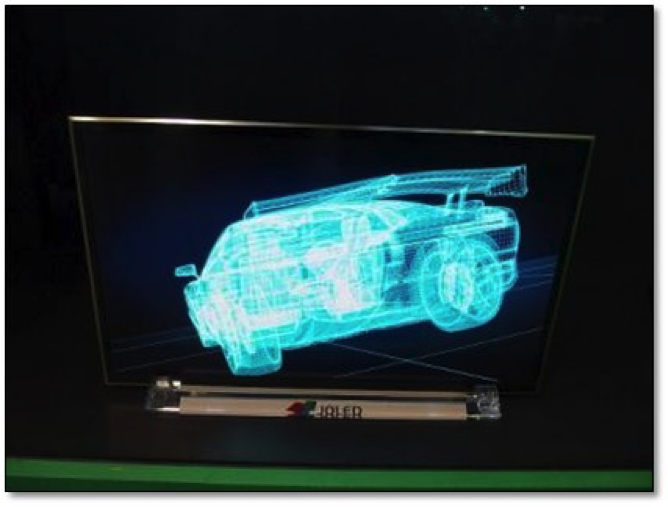 or large panel (TV, signage), JOLED has chosen to focus on the medium size OLED market, similar to notebook or monitor size displays, where there is only modest competition. Fig. 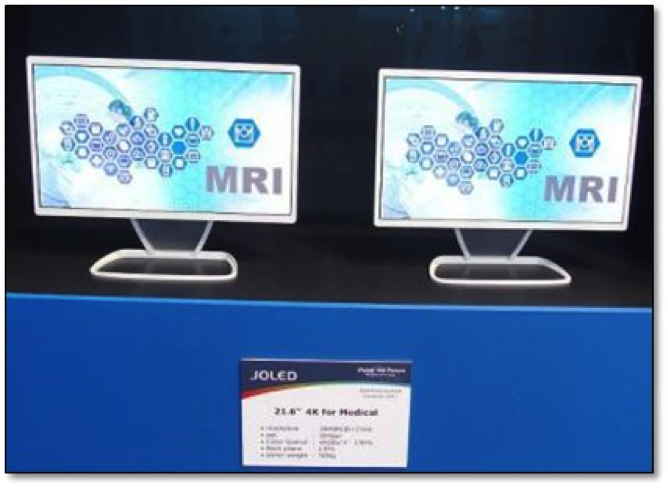 1 shows JOLED’s 21.6” 4K OLED monitor demo, with a similar product shown for general consumer applications. Of course, no demo would be complete without the prerequisite flexible OLED shown in Fig. 2, which unfortunately carries no specifications. JOLED is running a Gen 4.5 pilot line in Ishikawa that is based on ink-jet printing technology from Panasonic and OLED structure from Sony, with the expectation that the company will have completed the 1st phase of construction of a Gen 5.5 OLED fab in April 2018, and the 2nd phase in March 2019. While some expect JOLED to begin production of a ~20” OLED product this year, we estimate that the current line could produce 12,000 units/quarter at 100% yield, which would be quite optimistic, so we keep our expectations low until the Gen 5.5 fab opens in 2018. While Japan Display is currently an Apple iPhone display supplier, it needs to rapidly build up its OLED capacity to offset the loss of a portion of Apple’s LCD display business and any potential delay in such a timeline could have a significant effect on JDI’s sales. Japan Display has tentatively agreed to acquire 51% of JOLED, making it a consolidated subsidiary, with a definitive agreement scheduled for March 31, 2017however the agreement date has now been pushed back until late June, 2017, and the completion of the share acquisition, which was to be completed in the 1st half of fiscal 2017, has been pushed back to late December 2017. JDI stated that the company has been constructing a new business model and framework toward OLED commercialization, which needs more time to be discussed and completed. This has the potential for changing the expectations for fab timelines, although JOLED is still funded currently primarily by INCJ, and as such we will not make any changes until we get more complete details as to the progress of the fab planning and construction and whether the timelines will be affected by the postponement. This delay may have something to do with the decision that Mr. Honma Hosumi, JDI’s Chairman, and Mr. Shuji Ariga, President, would be retiring in June of this year at its board meeting held on March 22. Mr. Nobuhiro Higashi who has been president of JOLED will be the new president of JDI. JDI has been suffering from declining revenue because of decline of its smartphone panel business, which accounted for as much as 80% of the company revenue.